In most areas Fall Foliage in New England has passed and the glorious colors are further south. Don't hang up your camera for the year quite yet though because leaves on the ground make for beautiful macro photography objects. Visit your local nature wildlife sanctuary, park, garden or arboretum to explore the grounds and find these beautiful gems to photograph. 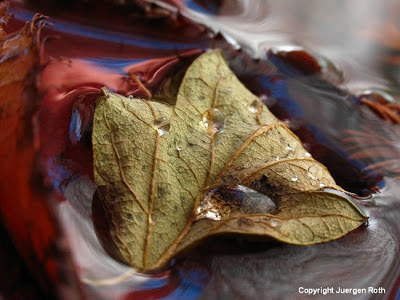 Look for leaves on walls or the edge of a local pond where beautiful leaf composition can be found. 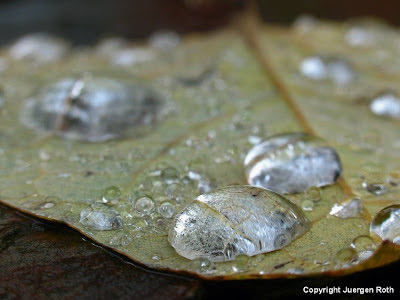 Have an open mindset and eye so you don't miss and overlook these little treasures, just waiting to be photographed. Raindrops always add a little extra to the picture and I regularly head out on rainy days or thereafter to beat the odds for higher success ratio. Most often I prefer to work with limited Depth of Field to keep the focus solely on the subject and eliminate any background noise. Overcast sky beautifully balances the colors and contrast. Don't forget to bring your polarizing filter that will help eliminate glare on the leaves and water while also saturating colors. That way Exposure times may be a bit longer but since we always use a tripod, there are no worries. Good luck and make sure to share your photos and tips with me ... looking forward to them! Thank you for such a great post.Beautiful shots and I'm feeling very motivated to give this a go myself. Thanx for sharing as always very helpful info with us :) Have a great day! Regards Coral.